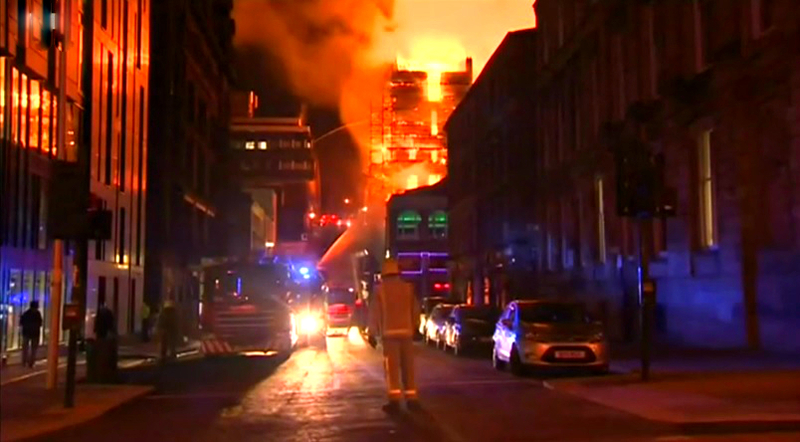 The prized Mackintosh building of Glasgow's world-renowned School of Art was devastated by a raging fire Friday night. The fire began around 23:20 and quickly spread to nearby buildings. The Campus nightclub and O2 ABC music venue also suffered "extensive damage". So far, no injuries have been reported. Firefighters worked through the night in what they expected to be a "prolonged" fire, according to Deputy Chief Officer Lain Bushell. It took over 150 firefighters responding to the scene to put out the fire over several hours as they faced "an extremely challenging and complex incident" Bushell added. Deputy assistant Peter Heath of the Scottish Fire and Rescue Service said "pockets of fire" were still burning but the majority of the blaze is under control. Witnesses uploaded harrowing video footage of the burning buildings which looked like a scene from a blockbuster disaster film. Heath also confirmed that all floors of the School of Art building were "extensively damaged". Heath added, "We remain firefighting in what is a very challenging situation." Police Scotland Insp Catherine McNally praised the response of the members of the public who were asked to evacuate. As daylight broke Saturday morning in Glasgow, fire engines, police officers, and bewildered bystanders could still be seen on Sauchiehall Street. Smoke is still billowing from the Glasgow School of Art and the other affected buildings. An eyewitness said, "This is a blaze, the building is just going up like a tinderbox. It's quite shocking."